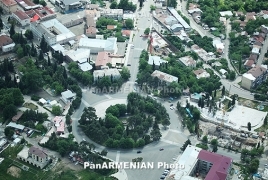 PanARMENIAN.Net - The Armenian National Committee of Australia (ANC-AU) has called for Australia to provide aid to Artsakh (Nagorno Karabakh), as part of a wide-ranging presentation made to the Federal Parliament’s Joint Foreign Affairs & Aid Sub-Committee in Canberra. The role of the Joint Standing Committee of Foreign Affairs, Defence & Trade, and its Sub-Committees, is to consider and report on foreign affairs matters, providing advice to the House of Representatives, Senate and Ministers. ANC-AU Executive Director Haig Kayserian presented to the Joint Foreign Affairs & Aid Sub-Committee, which is chaired by Mr. Chris Crewther MP and includes 18 MPs and Senators as its members. His presentation was followed by a Q & A session, where Kayserian was joined by his ANC-AU colleagues, including Chairman Khajaque Kortian, Vice-Chairman Vache Kahramanian and Research Assistant Alex Galitsky, who responded to questions from the panel of Committee members that were in attendance. The topics covered included: a) Australia’s position on the Armenian Genocide together with an overview of Australia’s humanitarian relief efforts to assist genocide survivors; b) the history of the Nagorno Karabakh conflict including current resolution efforts; and c) ongoing international aid programs in Armenia and Artsakh. The ANC-AU concluded their one-hour session by requesting the Australian government reviews its policy on providing foreign aid to Artsakh (Nagorno Karabakh). “Thanks to the advocacy efforts of our sister Armenian National Committee in America (ANCA), foreign aid has been secured for humanitarian relief efforts in Artsakh,” Kayserian explained. Since 2000, the HALO Trust - an international organisation that concentrates its efforts on mine-clearing operations in Artsakh - has used USAID dollars to finance its activities in the region. As well as U.S. funding, the HALO Trust in 2013 also received funding from the UK Foreign Office to finance its de-mining activities in Artsakh. “We thank the Joint Foreign Affairs & Aid Sub-Committee for allowing us the opportunity to make the case on behalf of Armenian-Australians, that Australia’s assistance should stretch to help the Armenians trying to make lives for themselves in the Republic of Artsakh,” said Kayserian. The presentation to the Joint Foreign Affairs & Aid Sub-Committee sought to achieve equitable funding to humanitarian de-mining activities in Artsakh, in a first time effort by the ANC-AU to secure Australian foreign aid. The appeal also called for revisions to Australia’s position on the Armenian Genocide and for a more balanced approach to future peace in the Republic of Artsakh.